There are four characters to chose from at the start of the game. Each has their own strengths and weaknesses, based on their speed, spellcasting agility, and magic capacity. Through my playthrough, I used the average character. The gameplay is very addictive, and relatively easy to get into. Basically, one of the characters starts off being "it". The person who is it cannot capture flags, so they must chase down the other character and touch them. Once you are not it, you can collect flags necessary to win the stage. Complicating the game is the obstacles you face. To proceed through the level, you basically have to build platforms. There are many levels with enemy creatures that usually require a number of blasts with your gun to kill. Speed tiles send you running really quickly, which can either make you quickly escape your foe, or send you far away from him. Probably the most compelling gameplay feature for experts is the magic system. Before each level, you learn a new magic spell. Some spells are mundane, like destroying a platform, but others can devistate your opponent, like the spell that causes all the creatures in the level to attack your opponent. 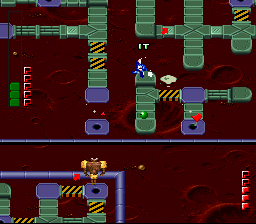 Powerup balls throughout the level allow you to charge your magic meter. 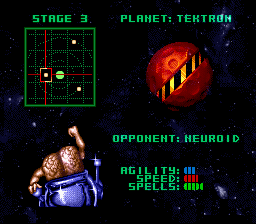 The music is pretty typical "sci-fi game" fare, comparible to games like Blackthorne, B.O.B., and The Lost Vikings. The sound effects are somewhat muted, though the voice that tells you "player 1 is now it" is really well done. The graphics aren't anything too special, but they do the job. On the whole, I liked this game. Had it been released, it would be an instant 2-player classic. The controls are a bit touchy, though not terrible. I really liked the thrill of chasing your opponent down and make him "it". One caveat about this prototype is when you die. Although there is a password system, the game tends to crash after the death scene. I guess that is why they call it a prototype. Or perhaps it is just a problem with the emulator. DreamTR owns a prototype of this game, and has taken some shots of it. Oddly enough, the prototype cart says "property of Electronic Arts", suggesting that they may have been interested in publishing it.